The Thursday Interview: Steve Dillon. 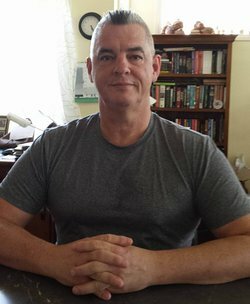 Today, I'd like to welcome Steve Dillon, co-author of “The Refuge Collection” to The Thursday Interview. Before we get started, a quick intro! Steve Dillon claims he was born on this little blue planet in a place that no longer exists (in his life). It was called Liverpool, England. He has devoted a lot of his allotted time studying its people, as well as those in Hastings, Reading, Exeter, Cornwall, Brussels, Vancouver, Melbourne, Canberra and many more places where his body has taken him. Steve now alleges to live in two worlds, but tends to spend most of his time on an island in a mythical place called Refuge. It is during his frequent visits there that he hopes to learn something of value from its people and their beliefs; their strengths and their weaknesses. Um… I can’t imagine why I wouldn’t, or what would motivate me not to write. That probably sounds pretentious, but as a kid one of the things I loved was English lessons, especially ‘composition’ or writing fiction- because for once we were not discouraged from using our imagination, in fact it encouraged. One of my protagonists in The Refuge Collection is described as having ‘a headful of hornets’, and this is how I sometimes feel when I have ideas buzzing around, and I need to write them down. Another huge motivator right now is that the Refuge Collection is for charity to support refugees in need, so I need to do as much as I can with the time available to me to try to make a difference. I so want to say “you should go and ask them”, but that would be facetious… So, for me, kids are more rewarding than anything else, including writing. We have two boys, and they’re completely different, but they get along so well and both love each other and their Mum and Dad too. I also come from a large-ish family of 8 kids, so I’ve always been around them, although I was the youngest, so they were always bigger than me. I can’t speak for anyone else, but I’ve heard that some people have pragmatic or financial reasons, or purely biological reasons, for having kids. No.5 What was the biggest challenge in creating the book "The Refuge Collection" ? I’m also series editor, and all the stories in the book(s) overlap and interleave with each other, which is mostly my job. Sequencing and continuity is tough, and it’s more like directing a TV series I guess… I would love to see the Refuge collection adapted for TV one day. Hopefully someone significant will read it and spot the potential, then it will happen. That other people’s viewpoints are different to my own. That goes for everything from politics to witnessing a road traffic accident, to how to treat the elderly. Sometimes I find it challenging to accept cultural differences, for example, but I’m trying hard to. No.7 How did you come up with the title "The Refuge Collection" ? Well, firstly this is a collection of stories, and they’re all set in the ‘fictitious’ town of Refuge. Secondly, this is a collection of over 30 writers and artists from across the globe, all giving their time, energy and talent freely in support of refugees. Thirdly, it’s a way to collect money and awareness for the plight of refugees. We’re supporting two charities at the moment- Sanctuary Australia Foundation and Refugee Action UK. By trying to see the other person’s viewpoint and understanding the difference in opinion. Sometimes they’re right, and in fact on The Refuge Collection, my editor Lee Murray often astounds me with her literary suggestions and feedback, and my wife Jackie beats me up with common sense all the time. It’s an innovative approach to a modern anthology of dark fiction- call it horror, thriller, ghost stories, weird fiction- label these how you will, they’re all different, delivered in a multitude of styles, so there’s something to appeal to everyone. Many of the contributors are award winning authors from across the globe- Ramsey Campbell, Paul Kane, Lee Murray, Kaaron Warren, Marty Young- the list goes on. Also, the profits all go to charity, so it’s a win/win for anyone who buys it- fictional horror stories in support of people living real-world horror stories. A new series of inter-related tales by multiple authors, bringing to life the little town of Refuge - 'A town like no other, yet like so many'. Volume 1 contains 6 stories with 5 more volumes in planning, making a total of 36 tales from Refuge. Over 25 writers and artists from across the globe have come together on this project in support of charity. These 'short, shuddering stories' are intended to enthral, tease, torment and terrify. Ghostly and eerie tales of supernatural terror that can be enjoyed as "a way for fictional horror stories to help victims living real-life horror stories"